"If nothing else we are a product of our influences". So says Vas Deferens Organizaton (VDO) on their web site, and those of you venturing into uncharted territory are stongly urged to take a moment and CLICK HERE to quickly gloss over the vast sea of influences VDO mines. Like few other musicians I've heard, VDO manages to glom together styles from numerous, often unrelated, genres to produce music that is crazed, intense, and always fun. In AI issue #4 we reviewed several VDO releases and interviewed Matt Castille. This issue we review six new releases by VDO and related projects released by the Tekito label in late 1999. A trademark of the VDO sound is the full use of the studio's possibilities in which the music seems to be 'choreographed' rather than simply mixed. That is, the music is often super-EFX'd, and the tapes sliced, diced, and reassembled into a new form that defies easy description. VDO's influences cover the gamut of space, psych, Krautrock, electronica, progressive, and the avant-garde, and trying to pinpoint the band's sound is both impossible, and, probably unnecessary. Electric Company and Vas Deferens Organization is another teamup between VDO and Brad Laner and features the classic freaked out madness that we've come to expect from the VDO camp. There are numerous layers of electronics and CONSTANT shifts in the action making this extremely hard to follow, yet one hell of fun ride. 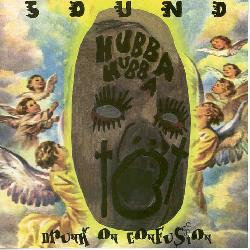 My favorite electro-mindfuck tracks are "Mind Of Ashes", "Extracting Epiphanies From The Thicket Of Implausibility", and "A Hep Cat's Electric Hair Ball Apparatus". Another great track is "Tinsel Termites In Barbed Wire Brassieres", a psychedelic eruption of the most violent and ear-splitting sort. At its core this is similar to Can and the brief groaning wigged out vocals are like Damo gone berserk (more so than usual). Freaky guitars and mindfucked electronics blast the brain from all directions. There are lots of cool electronics which can only be appreciated with headphones on, the drawback being that the really aggressive distorted stuff will destroy your eardrums. The suffering is well worth it though. But VDO apparently have some mercy as "Hushed Plateau Of Gelid Elves" gives the listener a break from the madness with its space-ambient (ambient in the VDO sense) exploration into a pulsating mechanical realm. Still aggressive but I was sweating from the first two tracks and welcomed the break. "Snappy Smarm" is another somewhat different track. Still an ambient backdrop but we start to get weird and slightly violent again. And the drum beat and trumpet give the music a jazzier edge. In summary, this is among the most well-crafted freaked out madness you can find. Aggressive electronica that demands the listener's attention. It's only 35 minutes in length, but believe me... it makes its statement quite succinctly in that timeframe. Sound is is a new project from VDO member Eric Lumbleau. The album is packed with the same studio zaniness that Electric Company and VDO has, but is far more whimsical in it's mood. I really liked the opening track "Picky Panic" which is relentless in its constant and abrupt changes in direction. A little drone here, a snippet of Coltrane there, and on and on. One of the disc's great tracks is the 16 minute "Phantasmagoricon", a trip into deep deep space. A digital drone beat pulsates along with electronic tribal percussion while the guitar cranks out rockin' space licks and a variety of electronics weave themselves amidst the chaos. The music soon settles into an eerie Univers Zero meets Goblin on acid bit, but not for long as the tune evolves through a number of themes, some both haunting and pleasant. And speaking of Goblin, "Dream In Purple Perspex" almost sounds like the guys got ahold of the master tapes to the Suspiria soundtrack and did a VDO number on them. Very cosmic, but also very twisted. On "Diaphonous Trails Of Narcotic Vapour In Translucent Caverns Of Fitful Slumber" the band really dispenses with the chaos to produce a gorgeous psychedelic journey full of space whispers, cosmic sitar lines, swirling synths, and even a bit of a symphonic feel. "The Fizzy Lifting Gas Time Machine" is an interesting tune. What sounds like a cello gives the track an ambient chamber music feel, floating along in an electronic stew of bleeps and sounds but also backed by an angelic choir. The song combines multiple layers of sound and instrumentation just like the more chaotic tracks, but at least goes into a different direction, this time playing music that is pleasant, but still wonderfully weird. In summary, this is a really good album, but however impressive Eric's studio craftmanship and creativity may be, the chaotic sound-collage tracks get a little tiresome after a while. The tracks I focused on are welcome diversions from the standard path and I would have liked to have heard more tunes like "Phantasmagoricon" and "Dream In Purple Perspex". But my criticisms come from having heard quite a bit of music from the VDO world. Newcomers will be bowled over by the whole disc. 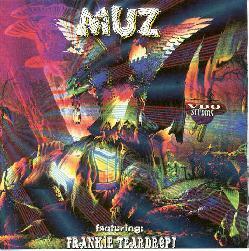 Muz's first release (LP only) in 1998 was a duo effort by Matt Castille and David Fargason, whereas this new disc includes several members including Doug Ferguson of Ohm, Yeti, and past VDO releases. 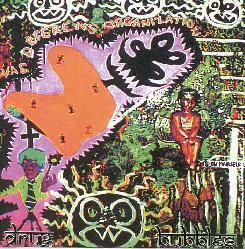 Like all VDO-related recordings, "Banana In Portuguese" has all the trademark collage-like craziness and studio mindfuck pyrotechnics. This is less overtly psychedelic than the first Muz album but it's still a totally spaced out effort full of great cosmic electronics. My jury is still out on which Muz release I like better, though "Banana In Portuguese" did a good job of holding my attention as it transitioned non-stop through a series of wild musical vignettes. Any attempt to discuss the disc's 16 tracks individually would be futile. 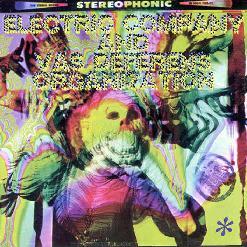 The music includes all the expected craziness, but covers a lot of stylistic territory including jazz, techno, industrial, salsa, various other ethnic influences (which they lovingly demolish), and there was a moment of nostaliga as I heard an eerie swirling Etron Fou organ on "John Denver's Last Confirmed Kill/Les Vinaigrettes". Rhythm, tempo, and structure have no meaning here, and one must just give in to the onslaught and go merrily along for the ride. But listen closely and ye will be rewarded with zany aural pleasure. Especially the "Rawhide"-cosmiche ending... Love it! Drug Bubbles features VDO at their freaky psychedelic best. I had received a pre-released of this a long time ago and mentioned it in our first coverage of the band in the October 1998 issue of AI. But this is a great disc and I'm glad it's finally been released. This version of VDO includes Matt Castille, Eric Lumbleau, David Fargason, Jim Edgerton, Anna Edgerton, and Doug Ferguson, (Ohm, Yeti). The crazed psychedelia that characterizes Drug Bubbles is really the side of VDO that I first discovered, having been introduced to them via the LP releases "Saturation" and "Zyzzybaloubab". All the studio manipulations and mayhem that are present on other VDO releases are here, but the pace is less manic and far more cosmic. There's also lots more guitar on Drug Bubbles than the other discs reviewed in this article. And the most cosmic and inventive of influences are here... Amon D��l, Can, and the earliest Pink Floyd on the one hand, but elements of the RIO progressive school like Aksak Maboul, Univers Zero, and Fred Frith on the other. As usual the band is cramming in a continual stream of changing themes, but it works well as everything seems to transition quite smoothly. VDO's method of mind expansion involves bringing in a construction crew to knock down the walls and build an addition. Don't expect their brand of psychedelia to let you drift away while you focus on your mantra. But if you believe in the benefits of shock therapy then Drug Bubbles gets my highest recommendation. 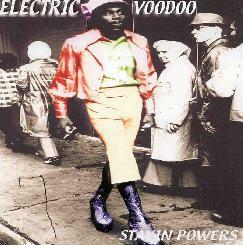 Electric Voodoo is a project led by a now-deceased musician named Taimer and produced by Matt Castille who also contributed keyboards. The disc apparently documents an authentic New Orleans voodoo ceremony, and indeed this sounds like traditional Haitian music that's been run through the VDO Studios freakization process. Basically it's traditional music with lots of freaky synths and sounds added. "Tiller's Azaka" and "Houngan Dancer" are the tracks that really turned me on with their manic percussion accompanied by cosmic keys and efx. As a whole, it all sounds cool but I'm not excited enough by the disc to warrant too many return visits. Definitely not for VDO newcomers, but should be of interest to veteran fans who want to sample Matt's production work on a non-VDO project. 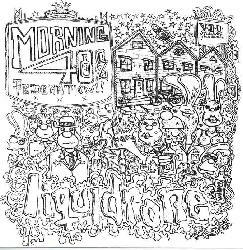 This is a compilation CD featuring four bands: Five tracks each from Liquidrone and Morning 40 Federation, and one track each from Diamond Dave and Paris. Liquidrone and Morning 40 Federation were both very impressive. Liquidrone isn't spacerock by an means, but they're a solid riotous band nonetheless. They start doing a dissonant vocal thing that reminded me of Thinking Plague or 5UU's. They then launched into a soulful R&B tune with a waaaaaay heavy thudding baseline and freaky efx. The next track continues in yet another direction doing a weird traditional music piece (sorry, I can't place it) that is mucho wild but just as quickly segues into an avant lounge jazz motif, and then settles into a soothing floating flute/horn tune, that then launches back into a heavy rockin' VDO-like cosmic bit... Phewwww!!!! Actually the styles and methods of dealing with traditional genres reminded me a bit of Snakefinger's output over his Ralph Records career. I'll be looking forward to more from these guys. Check them out at http://www.liquidrone.com/. Morning 40 Federation is another fiery band, not unlike Liquidrone. Both have horns and use them in depraved ways, though Morning 40 Federation is more guitar driven and includes even wilder synths. In fact, there is a metallic edge to some of this, but the totally freaky synths give it a feel like Motorhead produced by VDO, if you can imagine that. But this is way too simplistic an analogy as Morning 40 Federation hit the freaky-meter in a way that is far closer to VDO than Motorhead. The track by Diamond Dave was an interesting mind-melting psych version of any number of Delta Blues musicians. And Paris is similar as both feature mostly acoustic guitars. Again, very psychedelic but not as bluesy as Dave. The Tekito site indicates each of these CD's is available for $12 (postage included). At that price I'd say grab the whole batch, though the "Tekito Split Volume 1" disc isn't listed on their site so email before ordering. But if you're on a budget or want to tread lightly at first then start with Drug Bubbles and Electric Company, and then go from there if you like what you hear. You can visit Tekito Records at their web site. CLICK HERE to visit the official Vas Deferens Organization site. CLICK HERE to visit VDO's site at Mp3.com where you can listen to several sound files.